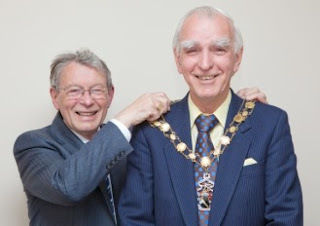 Outgoing Town Mayor Robin Ramsay hands over the chains of office to Coun Peter Cowey. PONTELAND'S new Mayor is aiming to bring the community closer together during his time in office. 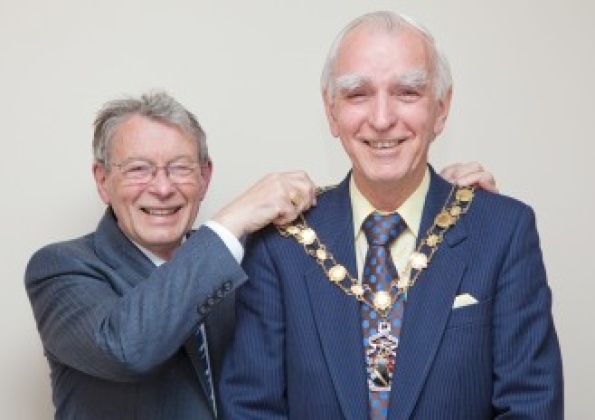 Coun Peter Cowey took the chains at the Town Council's monthly meeting after Coun Robin Ramsay decided to retire from the role. The father-of-two served in the RAF for a decade before his 32-year career in IT, from which he retired in 2002. He was elected as a Conservative town councillor in October 2009. The keen jogger and songwriter, who has lived in Ponteland for 18 years, said his early priorities would be seeing progress on the proposed town centre redevelopment, "the sooner the better", and relocating the council's offices to the Memorial Hall. Coun Cowey said: "I want to promote a sense of community where people are considerate and look out for each other, for example helping elderly neighbours and being fully prepared for the winter weather. "There is a limited budget so it is sometimes hard to meet expectations, but we will be a caring, honest, hard working and listening council." He added that he has some specific ideas for the coming year that will be discussed at future meetings. Coun Ramsay was Chairman, then Mayor, of the authority for a total of four years and he is proud of the achievements it made in that time. He said: "I've enjoyed this role very much and I appreciate the support I've received over the last four years. "I've chosen to retire because I'm a strong believer that others should have a go at it and it's beneficial for the council as it brings a change in direction. "The vision for Ponteland was to promote a place people took pride in and to encourage a greater sense of community. "We introduced popular new events, including the Civic Service and Music in the Park. "One of the things which has improved the village immensely is the new park entrance, we have a new children's play area in Callerton Lane and working in partnership with businesses we have installed CCTV, among many other things. We have accomplished a lot over and above the precept." Coun Alan Chilton, speaking on behalf of all members, recorded their gratitude for Coun Ramsay's "hard work and application". Coun David Butler was once again elected Deputy Mayor. The new Mayor's first key public engagement is the Ponteland Civic Service and Parade, which is being held on Sunday from 2.30pm.